This May 4, show us why you give big! If our cause is important to you, we hope you plan to donate to us during the Big Give 2017. If you'd like to share your personal reason for why you give to the San Antonio Feral Cat Coalition during the Big Give, please consider printing out and filling our "I will GIVE BIG" flyer. Take a picture and email to us HERE, or tag us on social media with #saferalcats and we'll share your pic! Download the flyer HERE. Don't forget you can donate during the Big Give early giving NOW and donations will go toward our Big Give total on May 4. In fact, we have an exciting prize to offer anyone who donated during the early giving period (April 27 to May3)...a $25 gift card to PetSmart will be given to a randomly selected donor. So donate now to see if you could win! Any donations made now will help us to win the Animal Welfare and Small Organization categories but will not go toward our Power Hour total. In order to win this prize, we need the most new unique donors. So tell family and friends they can help us by donating the minimum of $10 during 5 - 6pm on May 4th! Donate during our Big Give Power Hour and you could win! This year, our Power Hour for The Big Give is 5-6 pm. The power hour is where we can win extra prize money just for having the most donors during that time-frame. 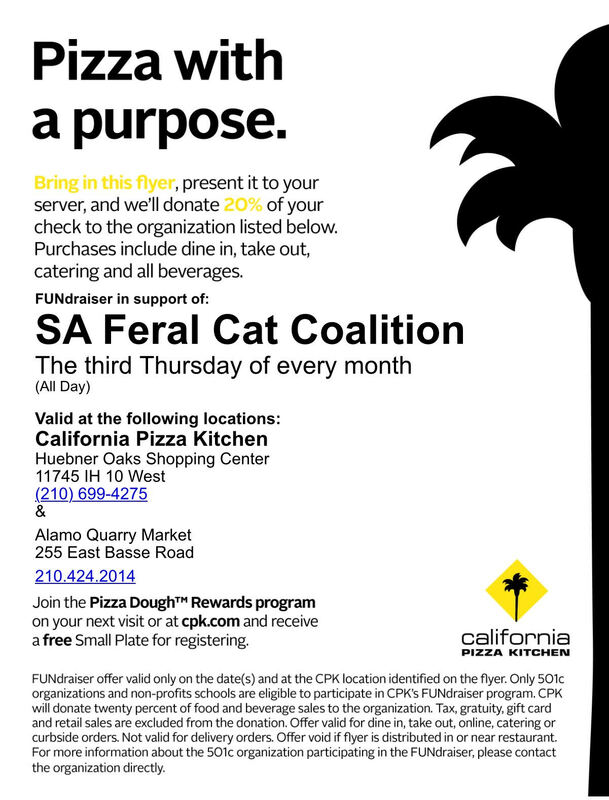 If you can donate to the San Antonio Feral Cat Coalition, please donate at this hour HERE. If your individual donation amount is $25 or more during our Power Hour, you will be entered into a drawing to win the Americus Diamond Circle of Support Diamond Pendant, which has been independently appraised by Universal Gemological Services at $500.00 retail replacement value. The more times you donate $25 or more during our Power Hour, the greater your chance to win! The winner will be randomly selected and notified after The Big Give event on May 4. April is Volunteer Appreciation month and so our Volunteer Fair held this month was a timely event! Various SAFCC volunteers were at hand at the fair to discuss the current organization's needs covering trapping, TNR class presenters, helpline, fostering, Petco cleaners and much more! Everyone enjoyed snacks provided by SAFCC Board members and was able to network and see if their talents matched up with a volunteer opportunity. Couldn't make it to the volunteer fair? Check HERE for our current opportunities. We are an all-volunteer organization so many thanks to everyone for doing their part to help make SA and more humane city for cats. SAFCC held a TNR meeting in Converse on April 29th for those interested in starting a Converse TNR group. If you weren't able to attend but live in or near Converse and would be interested in networking to support a local community cat group, please let us know. SAFCC volunteers attended the Coker United Methodist Church Mission Fair, a volunteer recruitment event for nonprofits. SAFCC was able to speak with all of the other groups in attendance and got good exposure. Several people took brochures and flyers to pass along to cat-feeding neighbors. It was a nice event complete with hamburgers on the grill and mariachis! Brooks Spay & Neuter Clinic now accepting ferals under our Subsidy Program! What is our Subsidy Program? You pay only $20 per cat for the spay/neuter, rabies vaccination & ear tip. To get this great rate, you just need to attend our free TNR Class. The San Antonio Humane Society is operating this clinic so we get the same, great service as the clinic on Fredericksburg Rd. Thank you Dr Hawkins, and Staff! If you live in 78217, don't forget about our PetSmart Charities zip code grant to TNR 500 cats in the 78217 zip code. This is FREE spay/neuter for any outside cat in 78217. All cats will receive a rabies vaccination and an ear-tip. Cats must arrive in a covered, humane trap to be accepted. Please share with anyone you know feeding cats in 78217! For more info on our current grants and clinics, please visit our website. Click the image to print a PDF of this flyer. Bobbin is a heroic mom who was able to save her two kittens by placing them on a rooftop. She was caught by a dog and almost killed in the process, her right hind leg requiring amputation. She continued to care for her kittens, in great pain, until rescued by a SAFCC volunteer. Bobbin is a dear, sweet cat who craves love and affection, however is still very shy and tentative around new people. Bobbin's surgery was done 1 month ago at ACS. She is ready for a new home now but would need someone who understands the trauma she's been through and who can have patience and understanding. What better way to honor Mother's Day than to adopt a mother who risked all to save her kittens! Email info@sanantonioferalcats.org if you're interested in Bobbin. Celebrating a Birthday? Having a lunch meeting? Or just need to re-fuel while shopping.... Present this FLYER when you dine in or take-out on May 18 and 20% of your bill will be donated to SAFCC. Did you know April was National Animal Care & Control Appreciation Month? We didn't either until Alley Cat Allies told us! So we want to give belated hugs & purrs to our great ACS staff - especially the Community Cat Program folks who are doing an incredible job! They have gone above and beyond for many of our outside cats, providing necessary medical and surgical care for free that these cats would not have received otherwise. Thanks to Fumiko and the caring vet staff at ACS!